Bigfoot debuts tonight on Syfy at 9 p.m. Eastern. This week’s Saturday night cheese platter, Bigfoot, is at least half-a-cut above other Asylum/Syfy co-productions, such as Almighty Thor and Mega Piranha. It’s an unmitigated piece of crap, but in its clumsy way, it makes an effort to deliver the goods. Like Bong Joon-ho’s The Host, arguably the best big-monster movie of recent years, it doesn’t go for that technique of building up suspense (and trying to conceal the limits of the special-effects budget) by postponing the audience’s first clear view of the menace. Set in South Dakota, it’s only a few minutes old before the title character looms up and takes charge of the screen. Unlike the usual furry, linebacker-sized humanoid, this Bigfoot looks like an elongated version of John Landis’ moth-eaten monkey costume in Schlock, and stands as tall as King Kong. (He steps on people and squishes them with his literal “big foot.”) It used to be that the best compliment you could pay a TV-movie was that it actually looked like a movie; The best compliment I can pay Bigfoot is that it actually looks like a dumb TV-movie, instead of a demo reel made over the weekend by the producer’s kids, to show to investors looking for an easy tax write-off. Maybe it says something about Syfy’s faith in their product this time that they settled for such a generic title, after such hard-sell marquee items as Mega Python Vs. Gatoroid and Dinocroc Vs. Supergator. In fact, it sounds pretty bad when either of these guys says anything. Williams has developed a craggy handsomeness that might be quite captivating onscreen if some depth came with it. But his solemn hangdog expression never varies, even when Fenn tasers him in the neck just to shut him up. And he clearly has no idea what kind of tone he’s supposed to find for his character, who tries to get publicity for himself by taking on the role of Bigfoot’s defender, talking to TV cameras about the creature’s inherent beauty and nobility after the monster, bestirred by Bonaduce’s music festival, comes running out of the woods, picking up people and tearing them apart like fresh bread. Bonaduce’s performance is a whole other level of rank. I was a fan of the reality series Breaking Bonaduce, an amazing show that went beyond exploitation (and self-exploitation) into some scary, galvanizing realm of meta-documentary. (In the course of filming, Bonaduce attempted suicide, then agreed to go through rehab only if the series remained in production.) On that show, and in many of his public appearances on talk shows and tabloid documentaries, Bonaduce came across as a smart, funny, self-aware guy who had no control over anything in his life except for one thing: magnetizing the viewer’s attention with his self-loathing self-regard. He may not have known how to hold his life together, but he seemed to understand better than most how his media image works. So it’s surprising that, cast here in a man-you-love-to-hate role in a Syfy TV-movie, he doesn’t just take it easy and be his usual perversely entertaining self. He tries to act, and he tries too hard, expostulating and grimacing and delivering every line so that you expect a river of saliva to form at the bottom of the TV screen. 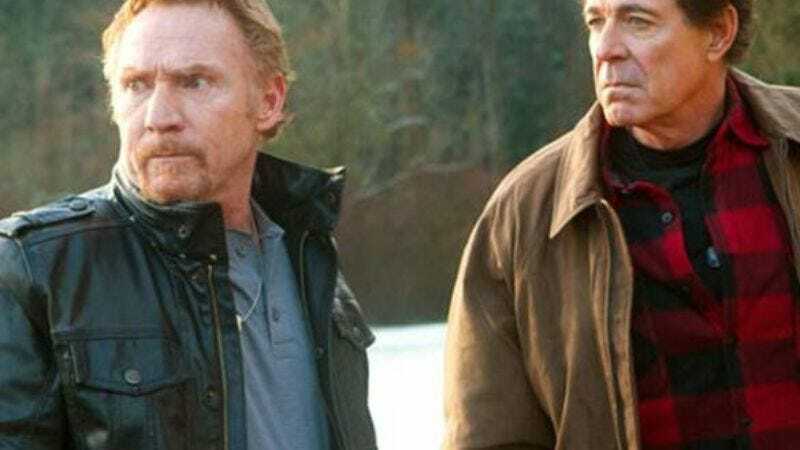 I don’t know if just being Danny Bonaduce is easier or harder than acting, but I know he’s better at the former than the latter, and he’s the only person who can do it at all. The movie’s other trouper is Alice Cooper, who has a cameo as himself, booked to perform at Bonaduce’s music festival. Alice looked a little forlorn in Tim Burton’s Dark Shadows, as if he didn’t mind making fun of himself but didn’t see why he couldn’t also have some dialogue. He has some here: When Bonaduce tells him the two of them go way back, Cooper replies, “I’ve known you for two minutes, and I don’t even like you,” adding, “I came here to promote my book on golf. You know that.” Alice is pissed off because he’s being asked to go onstage and entertain a crowd of what looks to be about eight people. The real joke, which I hope is an intentional one, is that, because this is an Asylum/Syfy movie, there wouldn’t be any more people in that crowd even if the festival was supposed to be a roaring success. The final showdown takes place on Mount Rushmore, and in its efforts to mess with sasquatch, the U.S. military blows Abraham Lincoln’s face off the monument. Happy Fourth of July from Syfy!